January 7th was the last day of the Paradise Pier character dining experience Ariel’s Grotto, which had been there since Disney California Adventure’s opening day. Surprisingly, even though I’ve been a passholder since 2005, I had never eaten there! I had always wanted to, but it was just one of those things that never happened. 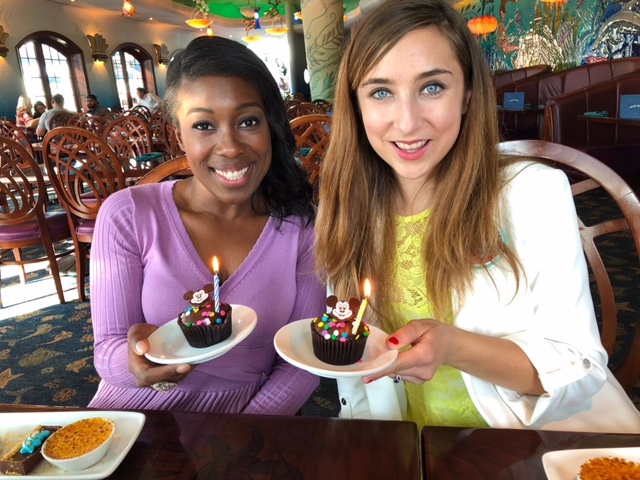 A few months ago, me and my friend Audrey Lee Young (check out her YouTube channel here, she has the most amazing Disney vlogs) decided to have a joint birthday since our birthdays are so close together! When brainstorming where they should be, Audrey suggested Ariel’s Grotto since we both love Disney princesses and neither of us had ever been. We made a reservation for January 7th for a group of 15, since it was a date near both our birthdays. Then it turned out to be announced shortly after that January 7th was the last day of Ariel’s Grotto, since the whole Paradise Pier area will be changing it’s theme to Pixar Pier! Talk about some pixie dust that we had the luck of booking a reservation on the last day without even knowing! It was so fun to have all of our friends show dressed in princess Disneybounds, all showing some of our favorite princesses in our own style! Once we got some photos, we headed to Ariel’s Grotto for the first time, on it’s final day of operation! For the main course, I had the corn cakes with black bean salsa and sauteed mushrooms and spinach – a dish that is probably one of the best vegetarian dishes I have had at any Disney park! As we ate, they had four princesses come out with a grand introduction: Snow White, Belle, Cinderella, and Rapunzel! The princesses made their way around the room to greet each table. Something I was very impressed by was the length of time each princess spent – they all spent quality time with us, and would take as many pictures as we liked. Although I will definitely miss going to Ariel’s Grotto again, I’m excited to see what Disney magic will take its place for a whole new experience to enjoy!